Please see our Helmets category for more choices. For optimum Bluetooth® and radio reception. This helmet has an integrated antenna, pre-installed speakers and microphone. Plug & play designed for the new communication system SC1. Extra-large anti-fog lens with a wide field of vision even when the rider adopts a racing posture. The C4 motorcycle helmet is in accordance with the testing standard DOT-ECE and can therefore be used throughout USA. The unique method for manufacturing shells used by Schuberth makes for low weight combined with optimum stability. Direct Fiber Processing (DFP) is an innovation developed by Schuberth. It involves an endless glass fiber being cut into pieces by a robot and being blown into a mould. This preform is baked under high pressure in a heatable mould with the addition of a precisely defined quantity of resin to produce an exceptionally solid shell. The multi-part construction of the inner lining allows for outstanding force absorption, thereby enhancing safety. The ShinyTex® inner lining is designed to ensure a secure and comfortable fit. The fabrics are fast-drying, washable and antibacterial. The seamless head pad guarantees outstanding wearing comfort. Good air circulation through multi-channel ventilation provides additional cooling for the wearer. 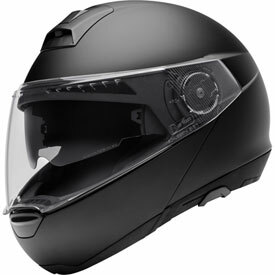 I was going to buy the shoei neotec 2 to replace my neotec when I saw the c4 schuberth clearance priced about 1/2 the price.I must say that at this price point, it is a hell of a helmet, however, had I paid the regular price, I would be VERY disappointed. In my opinion, if your going to pay around 800 dollars for a premium helmet, and the integrated speaker system isn't one of your priorities, the neotec or neotec 2 are quieter, have more features, and are more comfy than the c4.